You can clearly see the control console is filled with touch activated, faceted luminous crystalline controls in many varying colors. The ship is guided telepathically by the pilot after he or she places the palms of both hands into the gold quartz crystal, palm impression guidance controls. 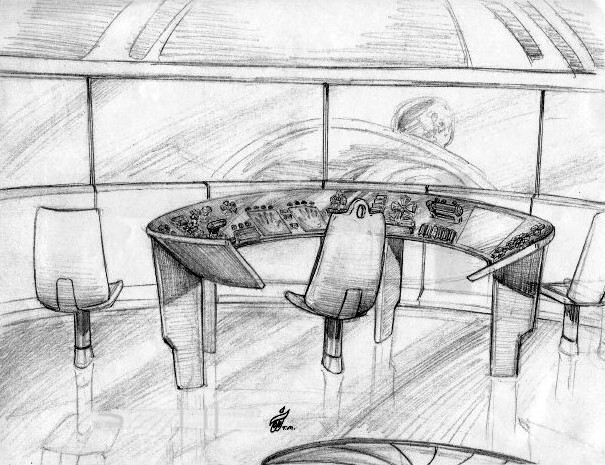 Take a journey and gaze into this Captain Kalem’s Scout Ship Control Room Sketch. This thirty-foot-wide disc shaped interceptor spaceship is from the Galactic Inter-dimensional Alliance of Free Worlds. When turned on, this anti-gravity powered ship radiates a thin blue light around its disc shaped haul. This Scout Class extraterrestrial, crystalline-based technology, is a anti-gravity powered disc shaped ship thirty feet in diameter. The Mazon fireball energy and beam weaponry it carries is used for defensive purposes only. This ship is capable of travel in space between star systems, in any type of atmosphere, as well as underneath the great depths of the oceans without any deep pressure effects. It can also shift out of phase so that the ship is rendered completely invisible to all perception. This same thing occurs when it shifts out of phase to harmlessly pass right through the hull of it massive mother ship to land on the launch bay floor. Note: You can explore Captain Kalem’s Scout Ship Control Room Sketch again here or at any time. You can also check out his lovable trusted Dren friend named Etta, as well as numerous other characters and scenes by clicking on any of the links provided above. To explore all illustrations go back to the main Classic Gallery or Custom Gallery with the linked revolving carousel display of larger images by clicking on the BOOK menu link provided at the top of each page. The drop-down menu will reveal the link to the main Classic Gallery and Custom Gallery carousel pages.